Note: All NAD27 UTM coordinates are in zone 10U. This effort was part of a larger journey in early July 2005. North Gardner Mountain, although not technical by the easiest route, entails some thirty miles of hiking with some 7,000 feet of total elevation gain owing to a 6,250 foot net gain and an estimated 500 feet of downhill (x2) on the inbound hike. The net gain is calculated from the trail lowpoint, 200 feet lower than the 2,900 foot trailhead elevation, to the summit elevation of 8,956 feet. Many people climb nearby Gardner Mountain as well on the same summit day. Edward Earl and I had little desire to do such given that Gardner Mountain has no significant prominence and is lower than North Gardner Mountain anyways. The driving approach proceeds by heading west of Winthrop across a bridge located immediately south of the town, followed by travel to this junction at (706773 E, 5372239 N). Proceed northwest 2.8 road miles to make a left turn at a junction onto signed Left Fork Wolf Creek Road. It is just over 4.5 road miles to the Wolf Creek Trailhead from this latter junction. The trail is long and relentlessly hot in the afternoon summer sun. After perhaps eight miles encounter a trail junction at (689577 E, 5372153 N). Bear right and continue uphill, with perhaps 2.5 miles remaining until a high camp is established in Gardner Meadows at (685802 E, 5373444 N) and some 5,700 feet elevation. Much deadfall and "singing trees" are encountered in the final mile prior to camp. Edward Earl and I took five hours elapsed to reach high camp. Dinner was well-earned. The following morning we took a route that went too far up the gully, and ended up bushwhacking through much deadfall and stream crossings. To avoid this mess, upon leaving camp for the summit, simply take the reverse heading of what proved to be a direct route back to camp from the talus slope south of the North Gardner saddle, namely, a bearing of 330 degrees true. This heading will see you climbing the hill immediately north of camp, in a diagonal fashion upslope rather than straight uphill. Certainly skirt deadfall when encountered higher up rather than religiously remaining true to the original heading. Use of this heading should bring you, after one mile, to the 7,000 foot base of an upward sloping basin whose upper two-thirds is filled with steep talus and scree. As an alternative to slogging up this slope you may wish to hike up the prominent ridge immediately to the west. Edward and I do not know if this ridge is climbable for it's entire length. Be an explorer and find out! Both routes (talus slope and west ridge) eventually lead to an 8,487 foot subpeak just south of North Gardner Mountain. The ridge route gets there directly, while the scree slope, if taken up it's center, leads to an 8,300 foot saddle immediately east of the subpeak. Edward and I found that clambering on the rocks located from halfway up the talus to nearly the 8,300 foot saddle was an acceptable alternative to some of the scree slog. Downclimb the 8,487 foot subpeak some one hundred feet prior to an 8,360+ foot saddle. The south ridge of North Gardner is before you. A use path leads along the east side of the prominent gendarme guarding the base of the south ridge. Use of hands is essential on this, the climb's "crux" section. It may be possible to follow the entire south ridge to the summit without anything more than Class 2. However in practice you would have to be quite fortunate to avoid Class 3 at some point in your climb. Edward and I therefore rate North Gardner Mountain by this route as Class 3. On the summit and in fine weather (such as our day), views of the North Cascades will be spellbinding. You can see such giants as Mount Baker, Glacier Peak, Bonanza Peak, Mount Shuksan, Goode Mountain, and, quite possibly, Mount Rainier at great distance in the south-southwest. Closer at-hand is Silver Star Mountain to the west (or west-northwest). We descended without incident down the south ridge, regained peak 8,487, and started down the ridge above timberline leading to the aforementioned tree-filled ridge alternative to the talus slope. We aborted the tree-filled ridge route in favor of the talus slope immediately east and below us. At around 7,200-7,400 feet my right thigh became increasingly weak - far greater than anticipated from a six hour climb. At camp I found it difficult to walk properly even after resting. The problem cleared itself, largely, after supper. This issue was later diagnosed as hypokalemic periodic paralysis - and was to become a far more serious concern three days later on Gypsy Peak of Pend Oreille County. Edward and I managed to enjoy a leisurely afternoon at high camp despite this mobility issue. At 6:30 p.m. I awoke Edward from a nap and he fired up the stove for our two (different) meals. Worried about my thigh, the following morning I had both coffee and a larger than normal breakfast to get me going down the trail - and this even though my thigh felt totally normal upon awakening. 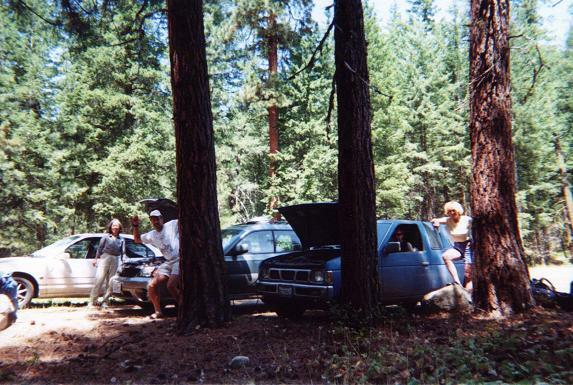 We reached the trailhead in roughly 4 1/2 hours, including breaks, and assisted a group of backpacker/climbers (who had also come from high camp) to jump start their automobile using Edward's electric cables.